PanARMENIAN.Net - Business Armenia has released a marketing package presenting investment opportunities in the jewelry sector. 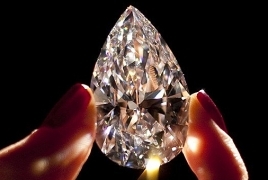 According to the research included in the package, Armenia is the second largest exporter of diamonds in the CIS region. Last year, more than 50% of Armenian jewelry industry production was exported to Switzerland. The sector accounts for 13% of the country's total exports. The jewelry production increased by 36% in 2017 alone and the average annual growth of diamonds processing was more than 50% between 2014 and 2017. Among the incentives in the jewelry industry is VAT discharge for import and sale of gold and precious stones, no VAT for sale of unfinished gold jewelry as well as the existence of a free economic zone for the companies operating in jewelry, watch-making and diamond cutting industries. The package is addressed to foreign investors and is presented under “Select Armenia” brand with “Make your move, Select Armenia” slogan.